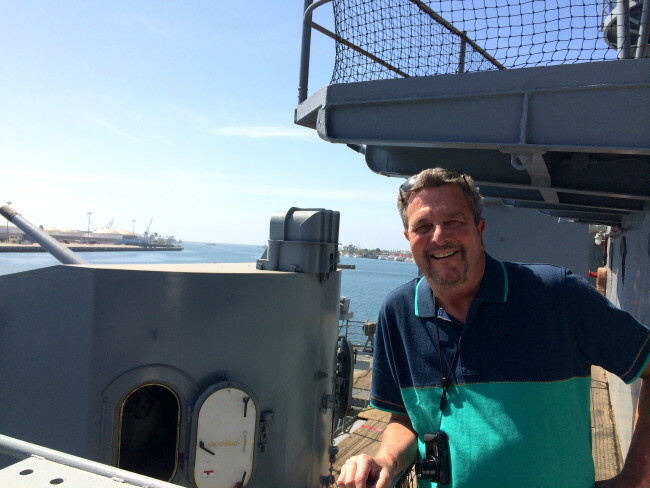 My dad was a naval officer who served in World War II on Guadalcanal, so the Navy (and especially naval vessels) have always held a special interest for me. 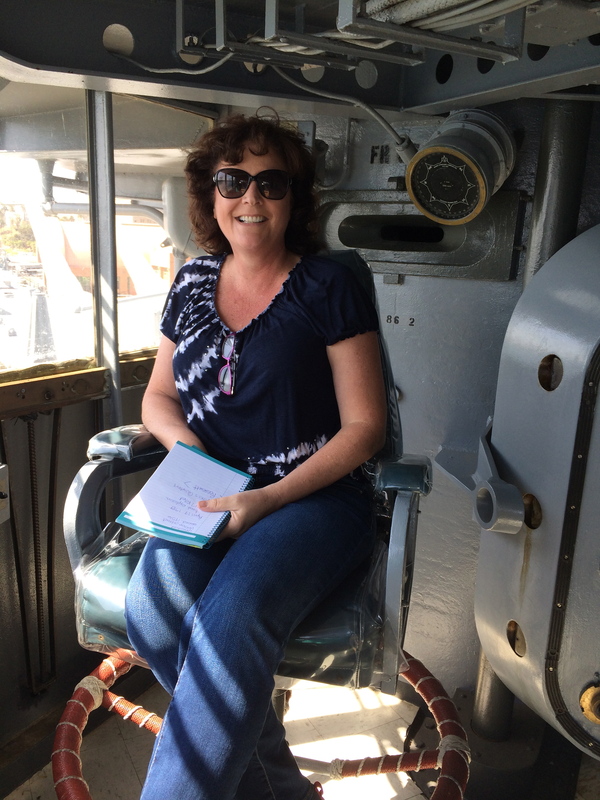 Tracy and I toured the USS Midway in San Diego about four years ago (we finally got Tracy and Mary out of the brig), and in the past year, we’ve had a couple of opportunities to go aboard one of the greatest battleships that have ever sailed the seas. 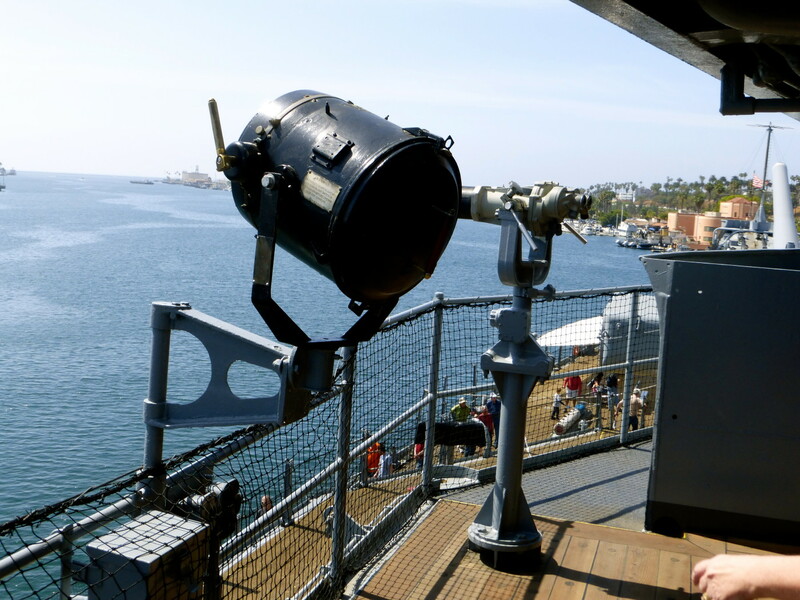 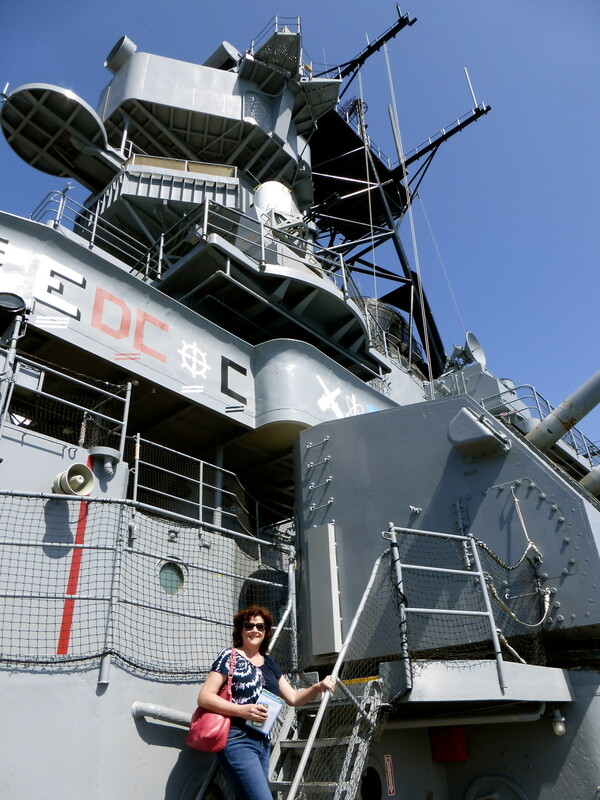 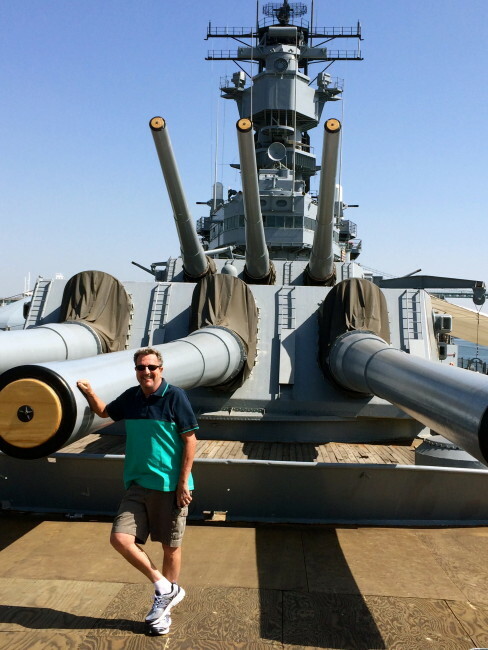 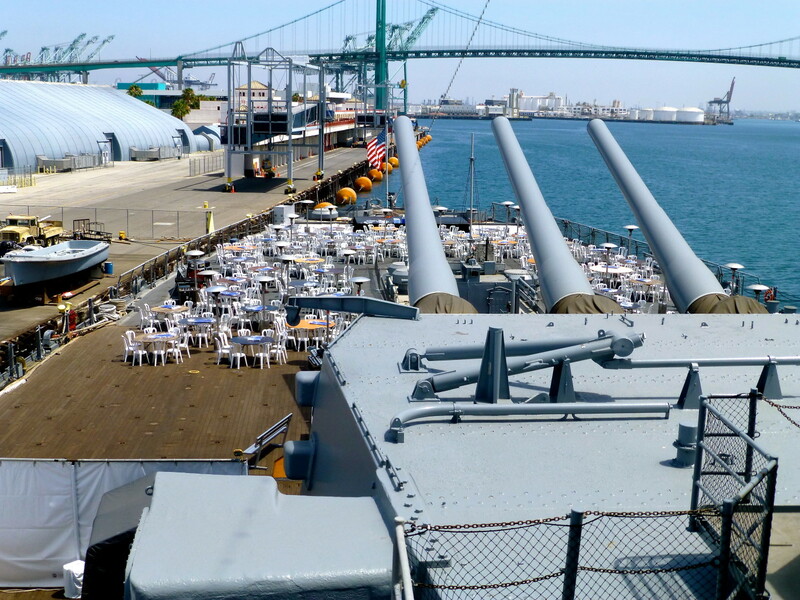 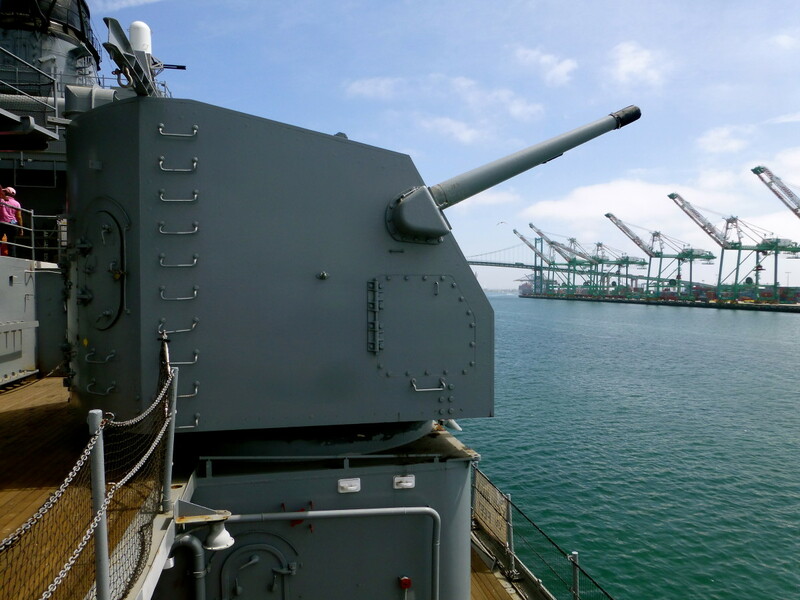 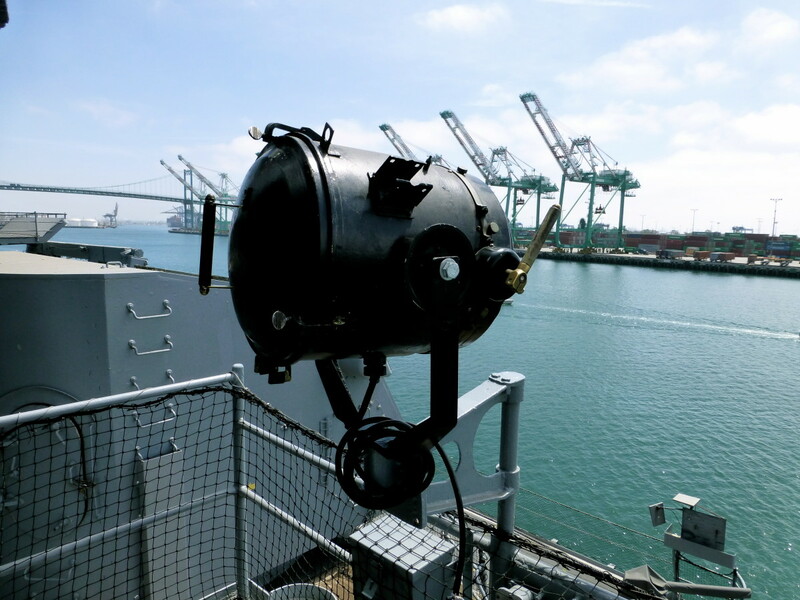 On a recent Sunday morning (April 19th…the date is important), Tracy and I put on our sea legs and served our second tour of duty aboard one of the most important ships in American naval history…the Battleship IOWA. 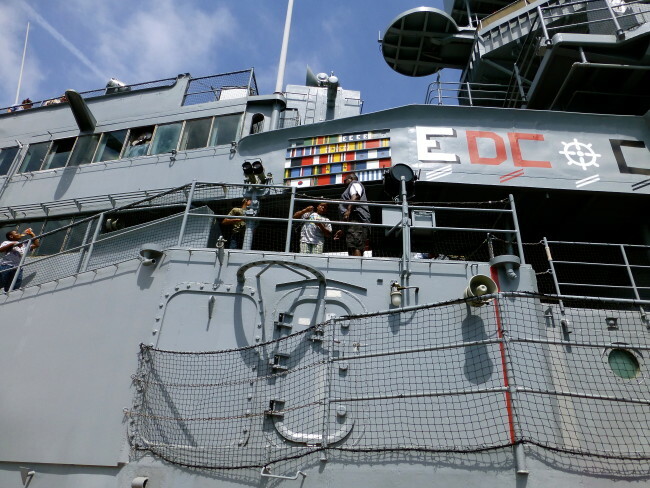 This ship has served in numerous world conflicts, and it’s been a floating museum in San Pedro since 2012. 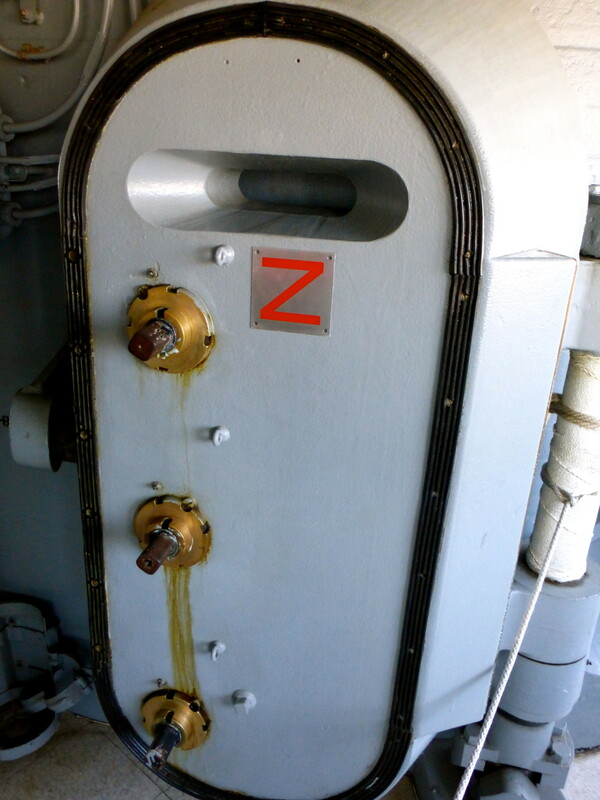 To get in the mood, I started the day with a navel orange, which got me in ship-shape condition. 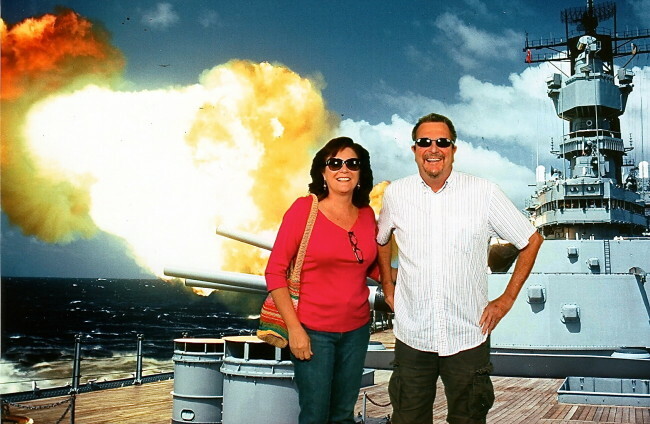 We purchased our tickets online (slight discount for buying online…and even a further senior discount for old geezers like me…62 and older) and arrived at the ship shortly after it opened at 10:00 a.m. Before boarding, we got to have our photo taken in front of a green screen. 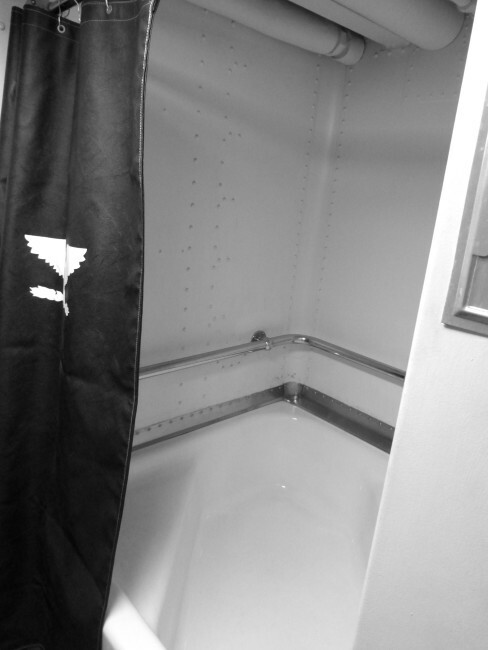 It’s here where one can display their finest acting talents. we channeled our inner actor personas and covered our ears with our hands and brandished a look of fear on our faces that were definitely Academy Award-worthy. Sure it’s cheesy, but we bought the pictures at the end. 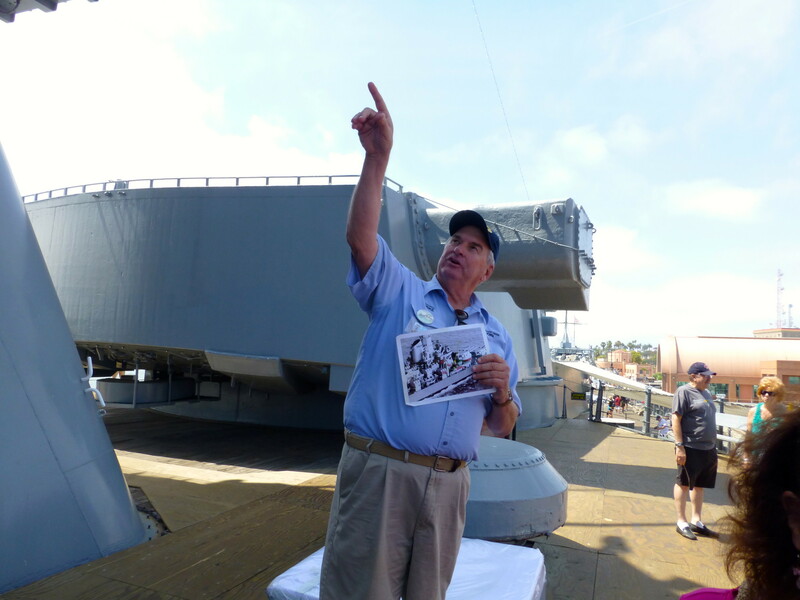 As you board the IOWA, there are veteran docents (or should that be docent veterans) who explain the route to take on the self-guided tour. 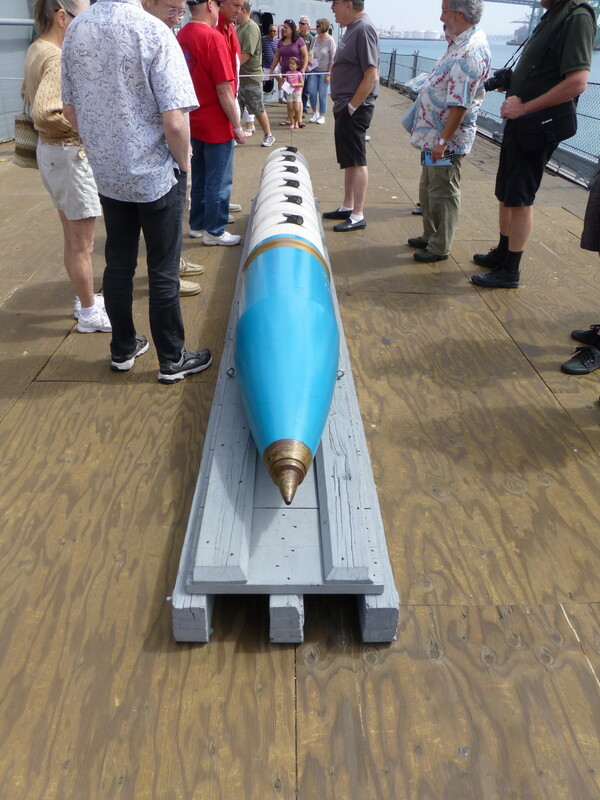 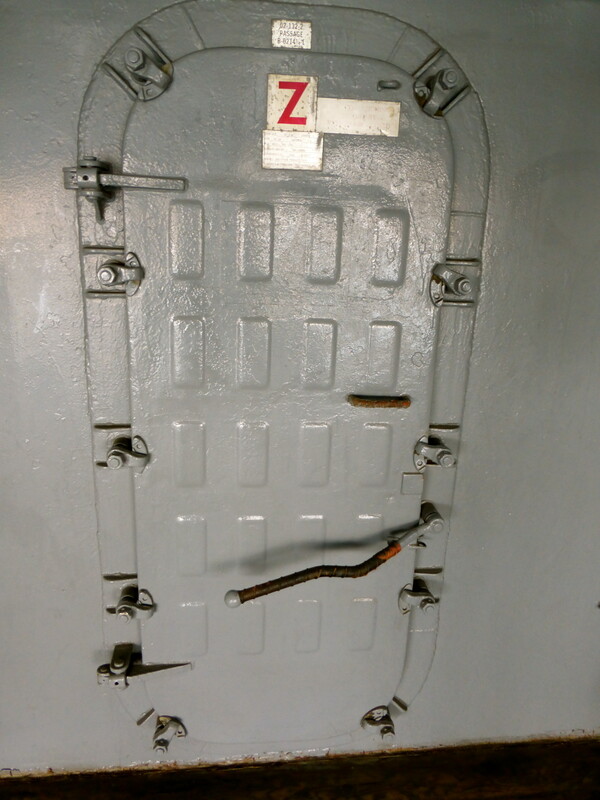 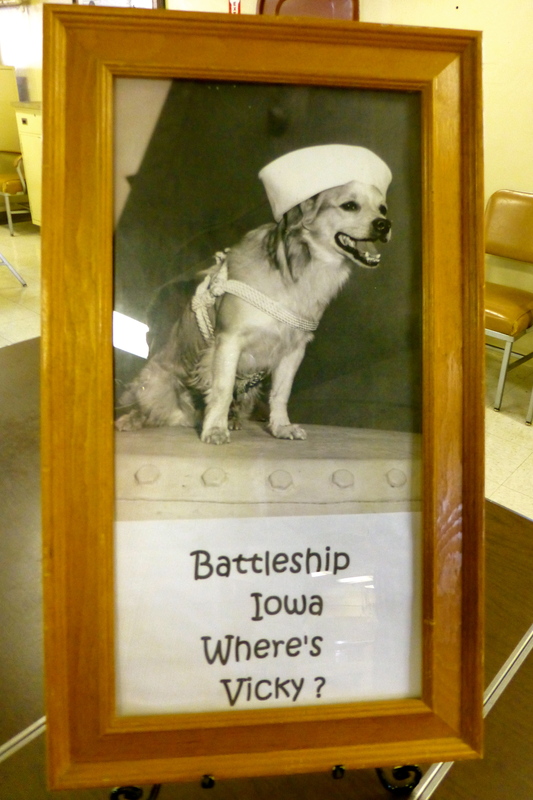 Our vet informed us there would be other vets who, at various venues would reveal more about the ship and its history. 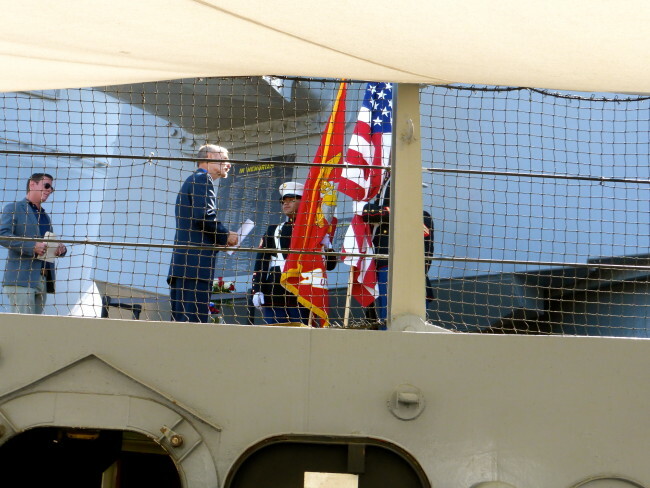 On our most recent visit, as we listened to the naval veteran explain the ship’s history, we looked up and saw what looked like the end of a formal and somber ceremony (that’s why April 19th is an important date). The most important detail we heard was that there were lots of stairs…and they were very steep. 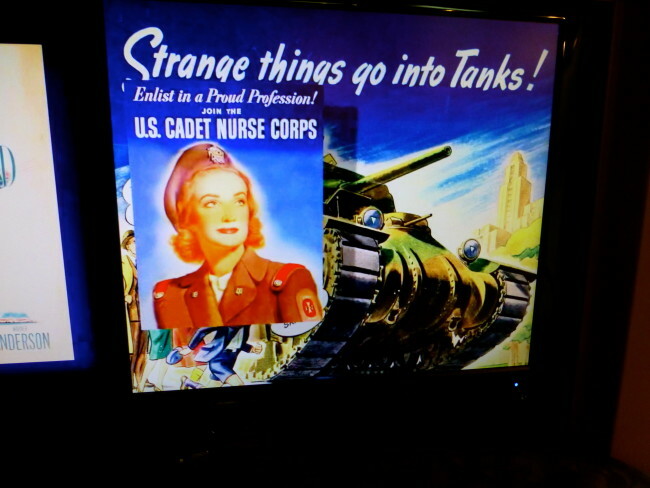 Believe me; they’re not kidding. 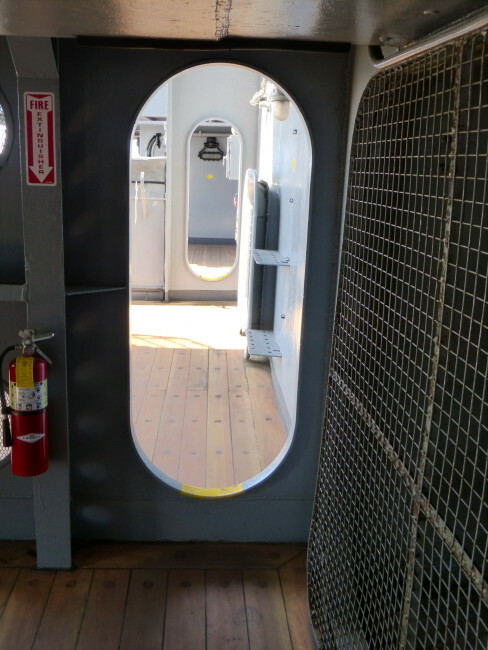 Watch your step!!! 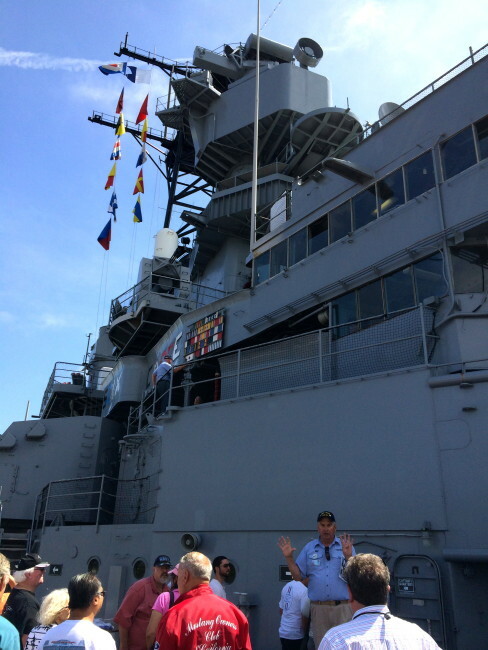 We started our tour by walking toward the front of the nearly three-football-field long ship (887’ to be exact), where I, of course, took a bow. 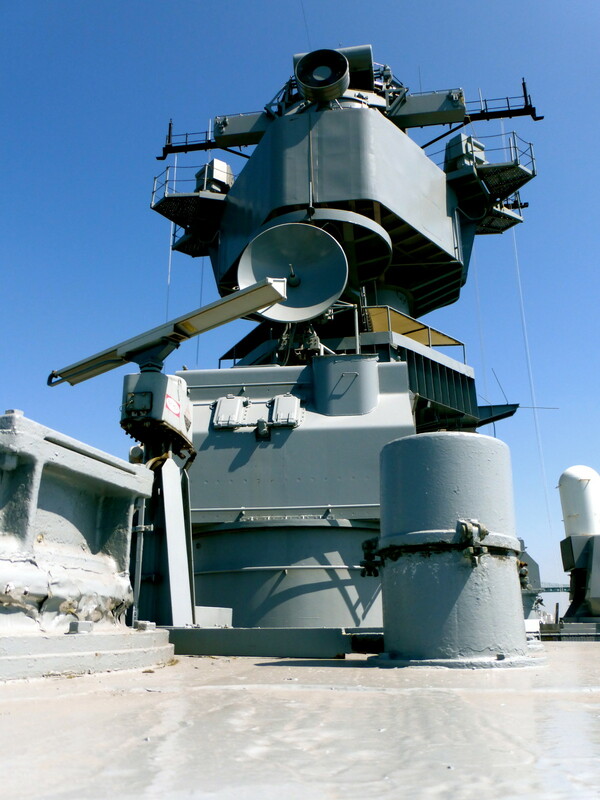 I got a serious case of Turret Syndrome looking at the Forward Main Battery, which has seen a lot of action over the decades. 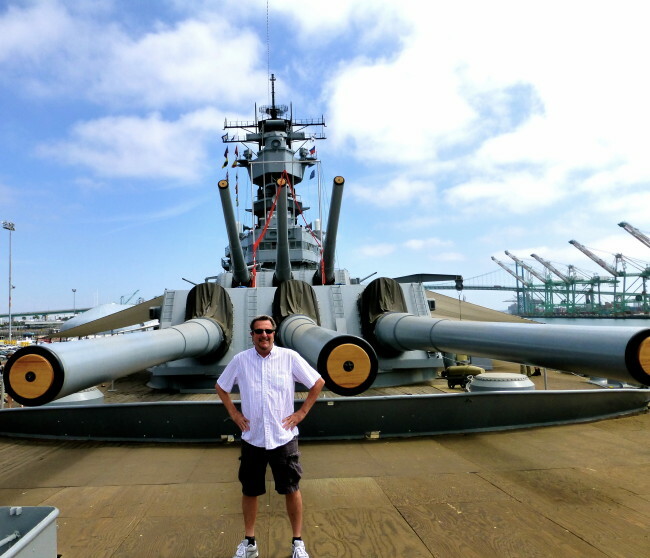 Being a man of high caliber, I posed for a picture. 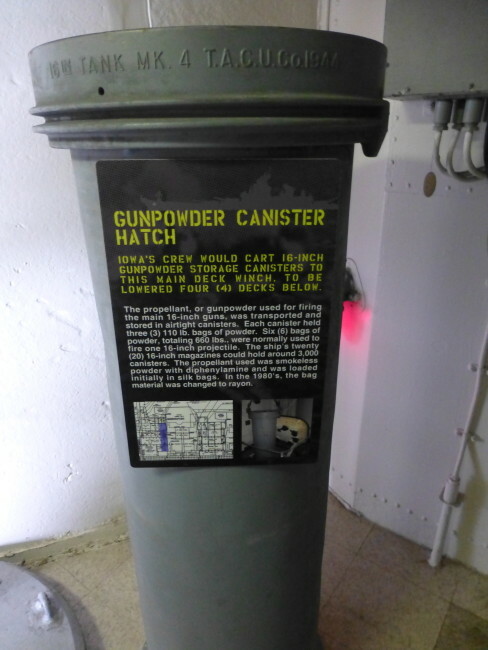 Turret Two, one of the 16-inch, 50-caliber gun turrets took a big hit from Japanese shelling during the Marshall Islands campaign at Mili Atoll in World War II. 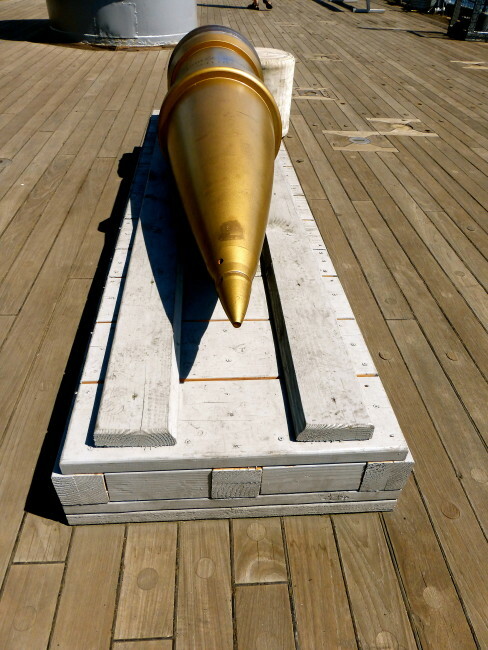 It took a licking but kept on firing. On both our visits, fire boats greeted us. 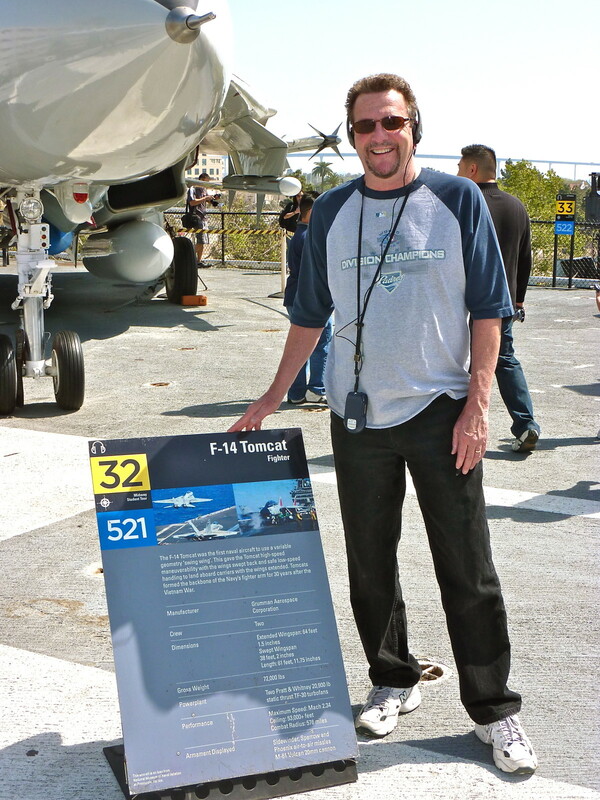 It’s nice to be wanted. 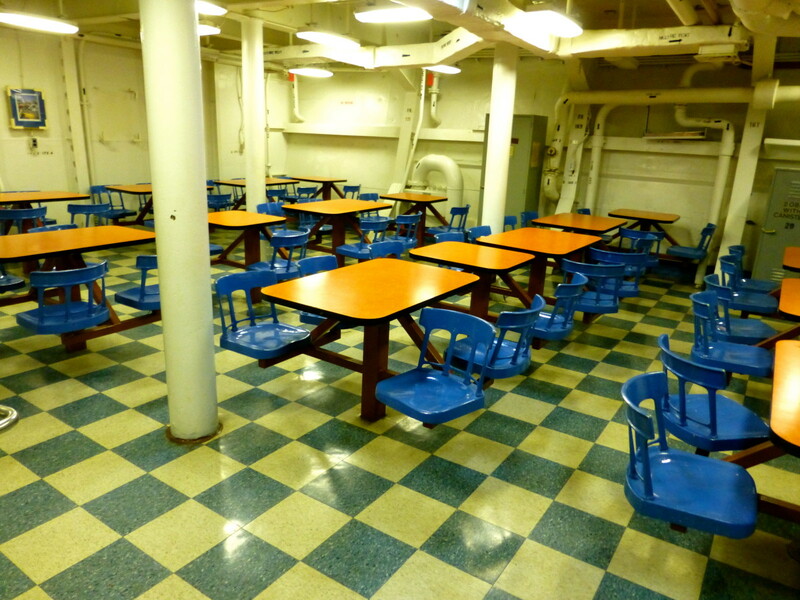 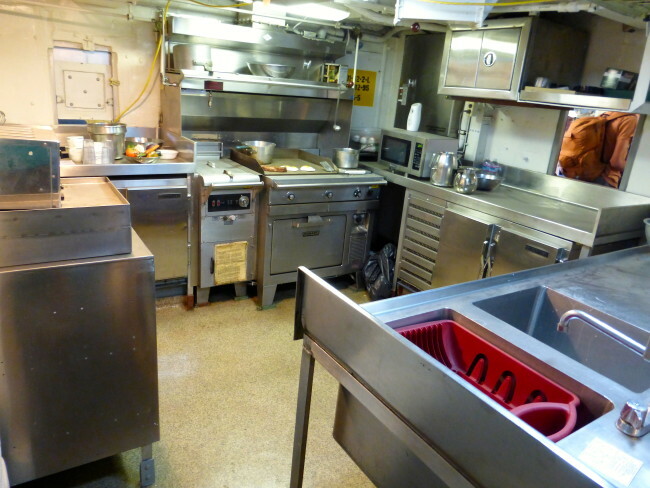 We toured the executive officer’s quarters of the ship, and while better than the enlisted men’s quarters, it’s no night (or year) at the Ritz (or Motel 6 for that matter). 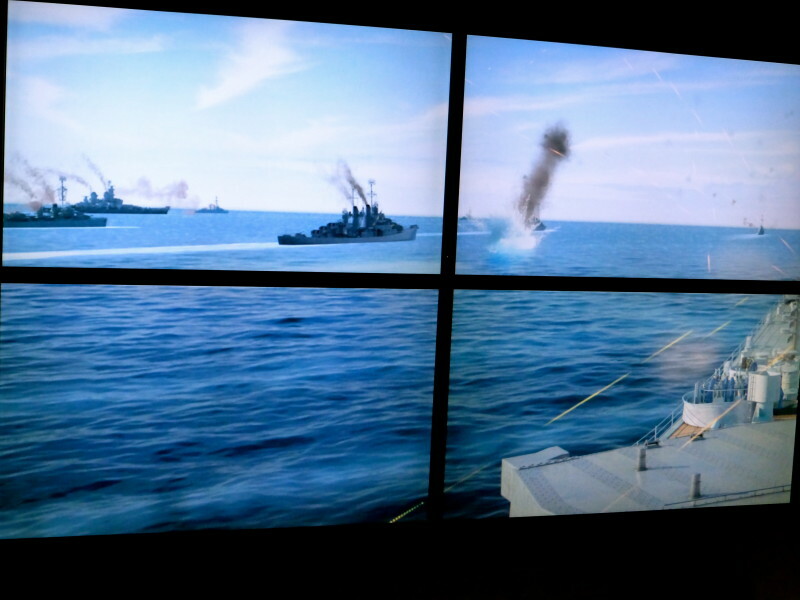 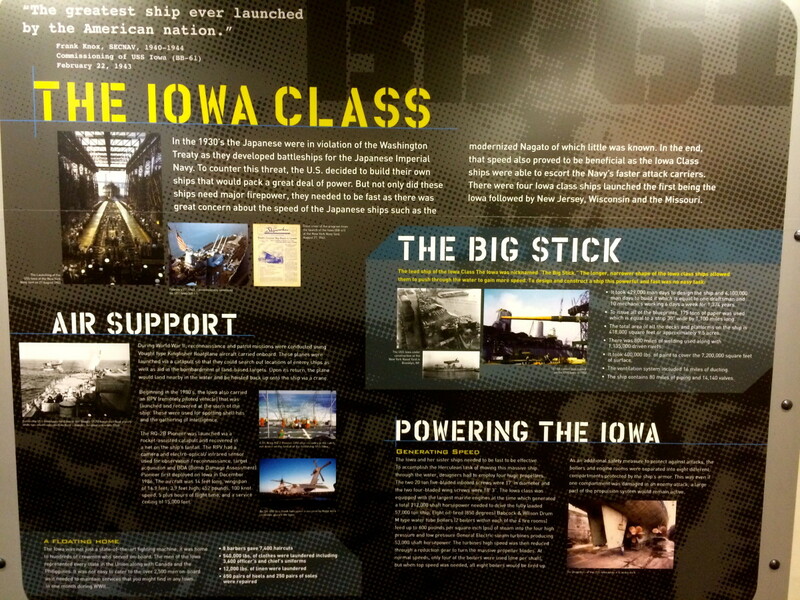 On our first tour last year, we were led to a room where docents explained the history of the IOWA. 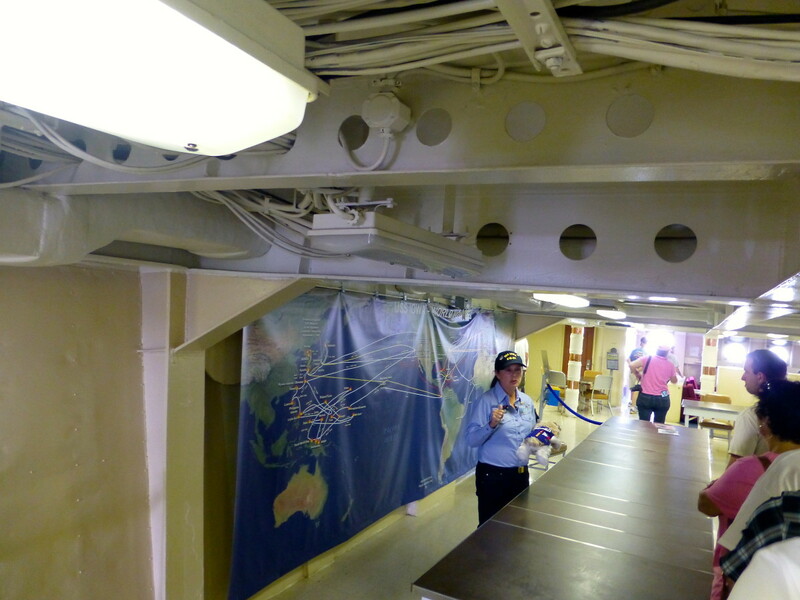 This area provided a couple of interesting tidbits. 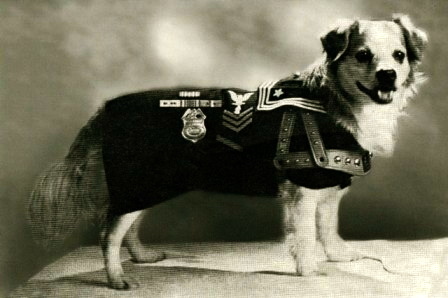 The first story was about a dog named Vicky. According to the IOWA website, “The dog quickly won the hearts of the 2700 officers and sailors. He (yes, a boy name Vicky) was outfitted with a special sailors suit and even swam in a 50-yard qualifying test with other sailors.” I’m sure he dog-paddled. Also from the USS IOWA website, “In November of 1943, the Iowa received the Top Secret mission of transporting President (Franklin) Roosevelt across the Atlantic to the Tehran Conference. 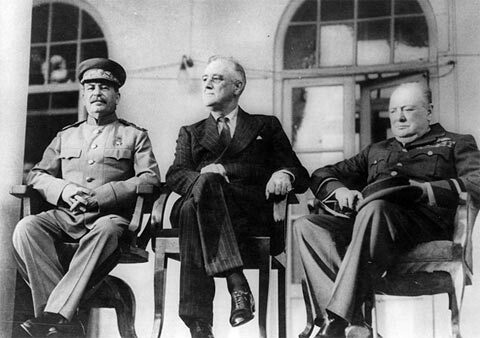 Roosevelt’s party included the Joint Chiefs of Staff along with their aides as well as his own presidential staff. So Vicky slept at the foot of the President’s bed in the Captain’s Cabin during Roosevelt’s 15-day stay on board the IOWA. 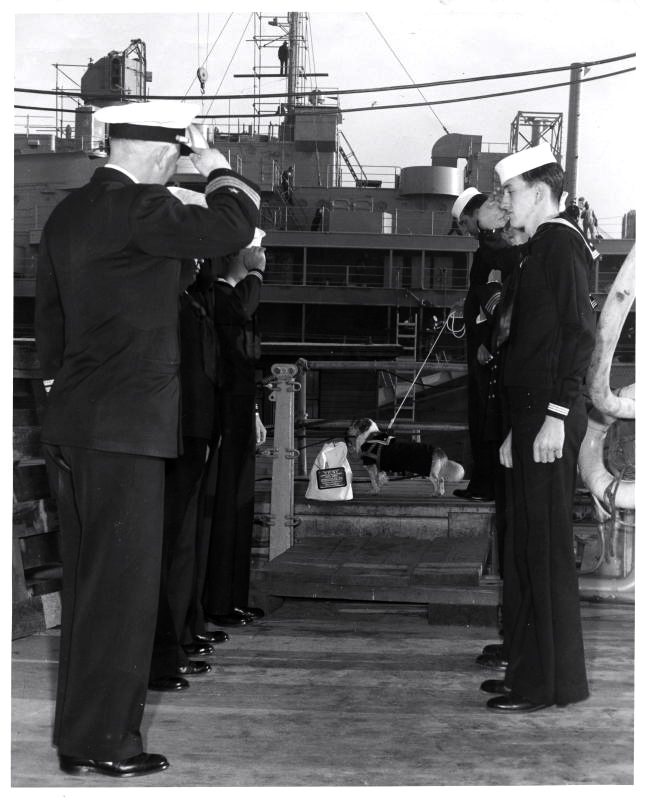 Vicky did have one misadventure where he went missing. 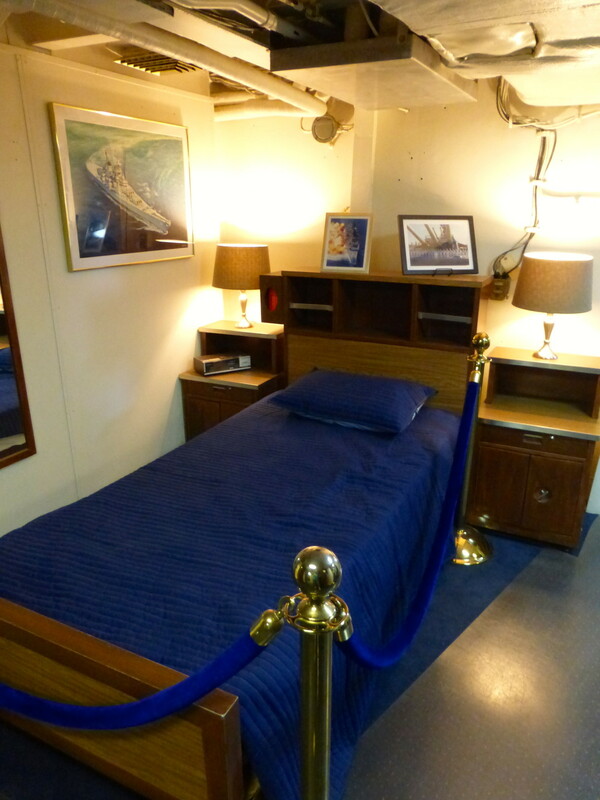 When Vicky was found, the captain had his rank reduced (no nepotism on this ship mister!). 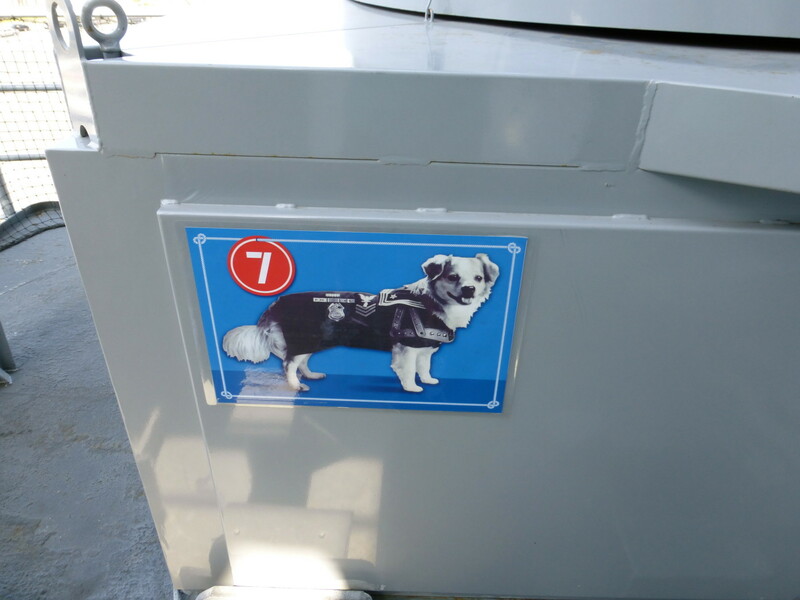 Today, Vicky helps lead you on the self-guided tour with numbered signs along the route that corresponds to a brochure given to you at the beginning. 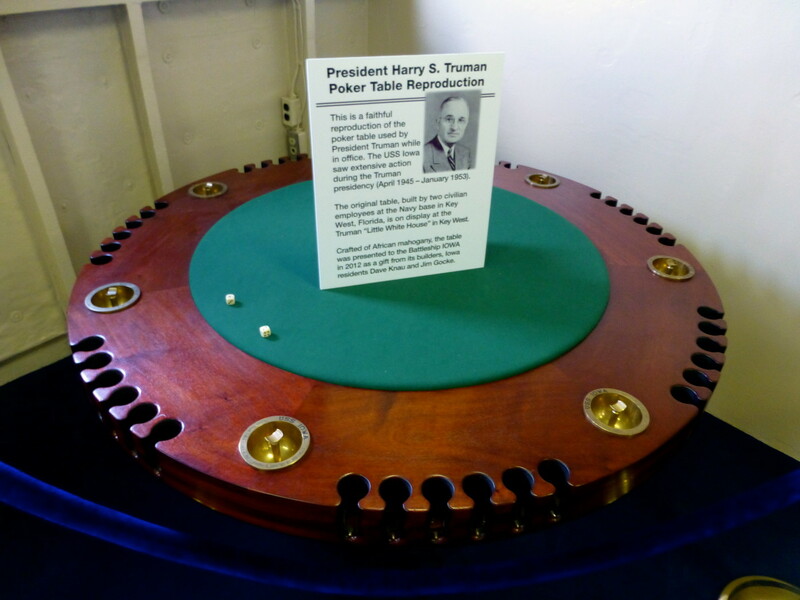 Also located in this room, we saw a reproduction of the poker table of President Harry S. Truman. 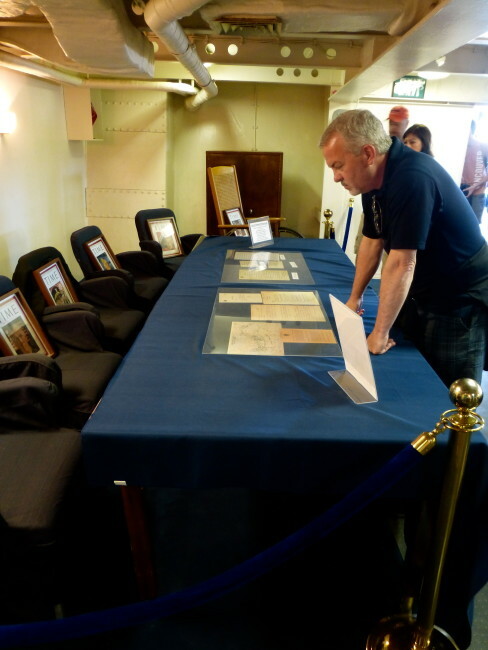 I was going to ask why his poker table was here, but the room was crowded (I’m telling you straight…it was a full house). On our second visit, the room was unavailable due to the ceremony I wrote about at the beginning of this report. 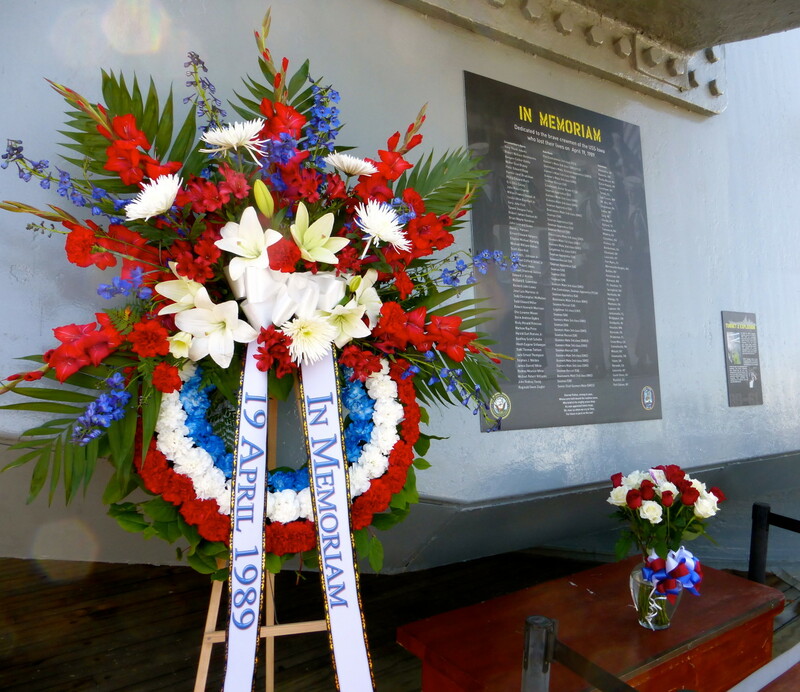 April 19th turned out to be the anniversary of a tragic event that occurred aboard the Battleship IOWA. Stepping back on deck, we saw a wreath and the reason behind the ceremony. 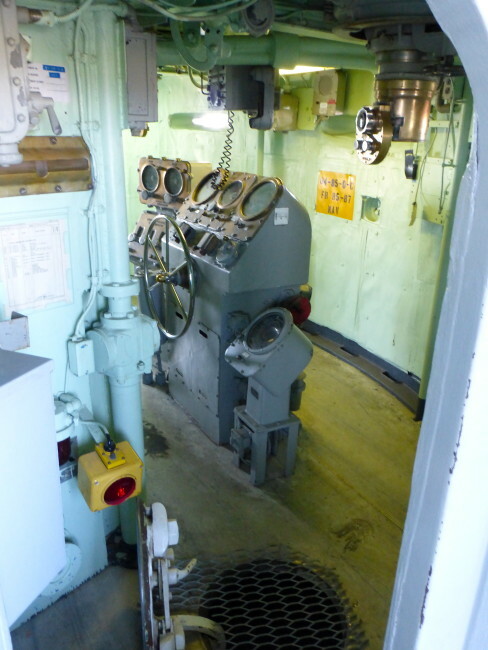 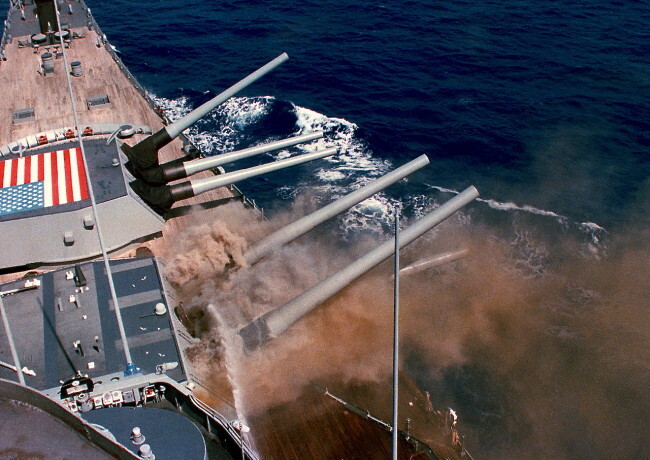 On April 19, 1989, the IOWA was conducting peacetime drills near the island of Vieques, Puerto Rico, when, while preparing to fire Turret 2, an explosion in the center gun room killed 47 crewmen aboard (a crewman took the picture above on that fateful day). 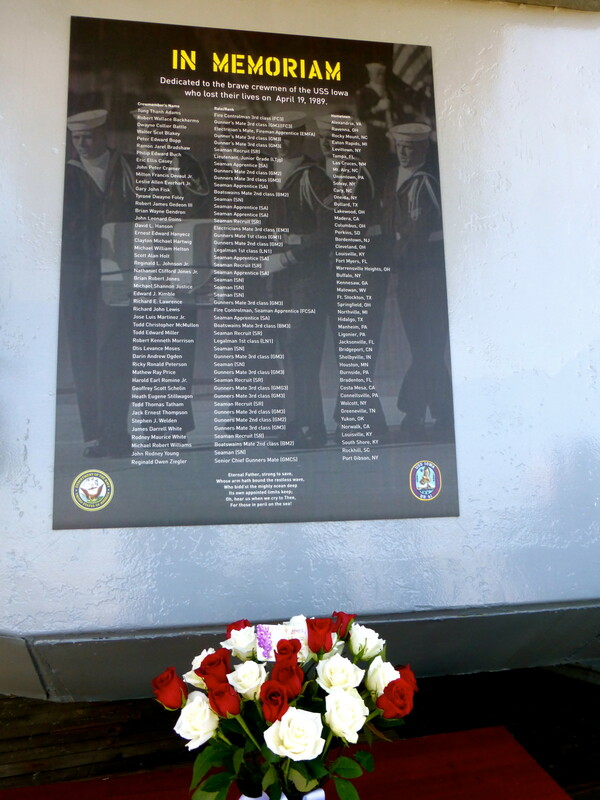 There is a plaque commemorating all those who perished that day. 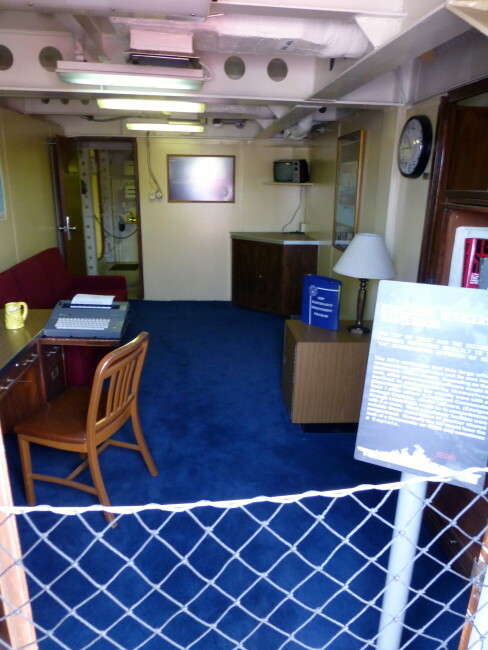 Before entering the Captain’s Quarters, a docent gave us all a quiz regarding famous naval Admirals. When asked about Admiral Halsey, I gave him no “Bull” with my answer. 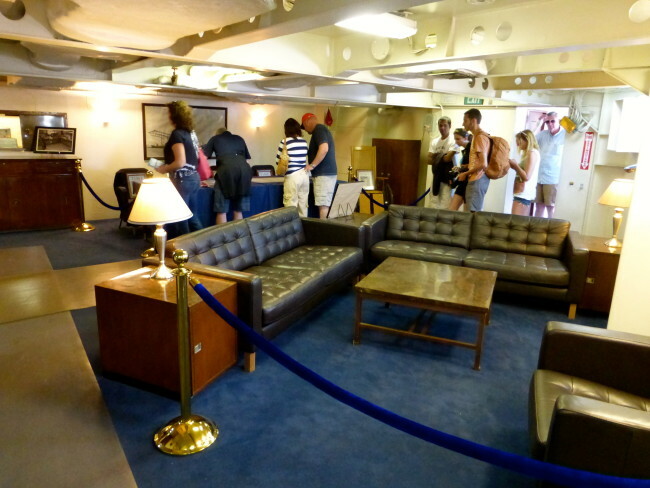 Now it was time to enter the Captains Quarters where FDR held meetings with high rankings admirals and generals on the way to the Cairo Conference and the Tehran Conference in November and December of 1943. 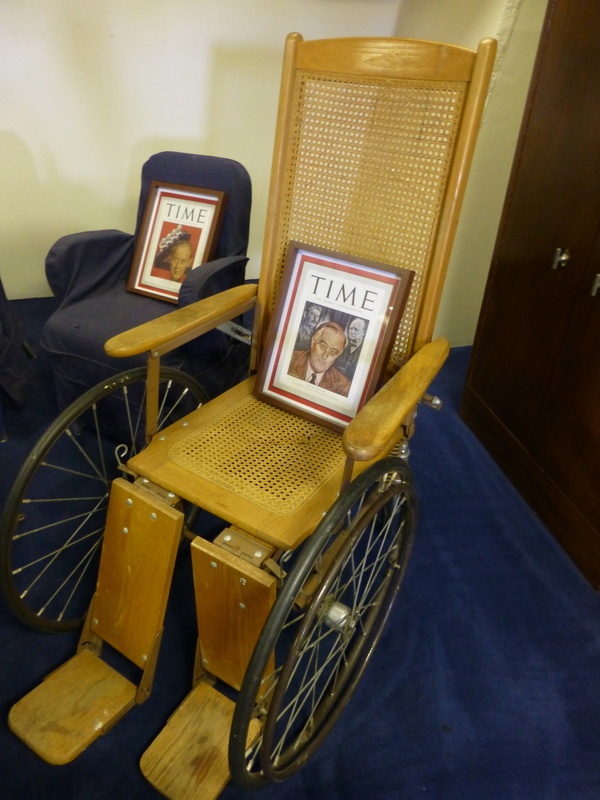 There was also a replica of FDR’s wheelchair. You’ll remember that Captain McCrae offered his quarters to Roosevelt when he was on board. 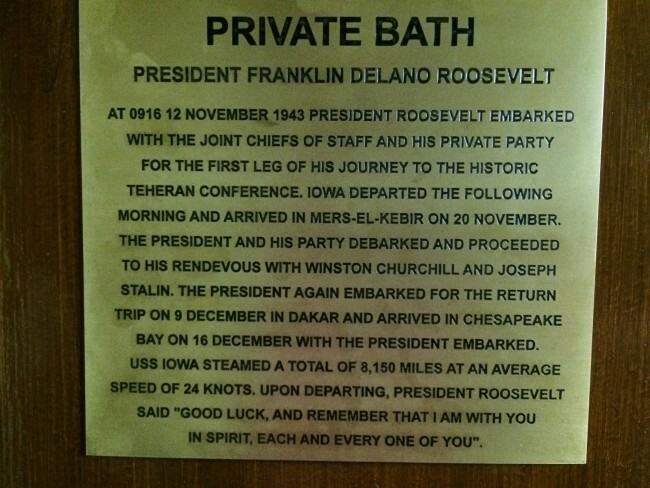 … and the famous FDR bathtub.” Because of his polio, Roosevelt was unable to take showers, so the tub was custom built for his time on board. It was like stepping back in history (even my photo came out in black and white). 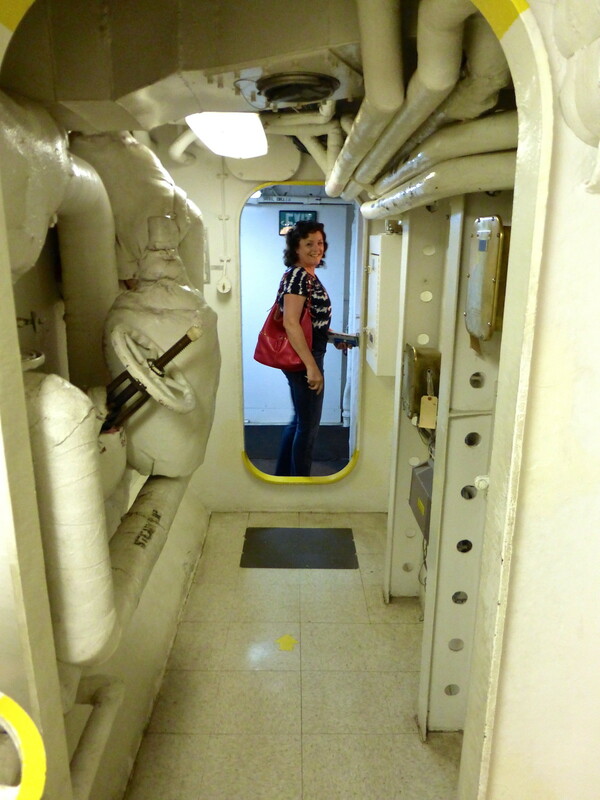 Tracy and I traversed the narrow hallways…carefully! 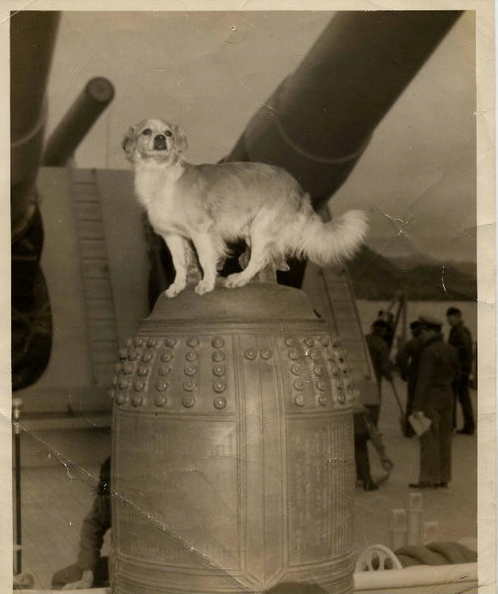 …and moved on. 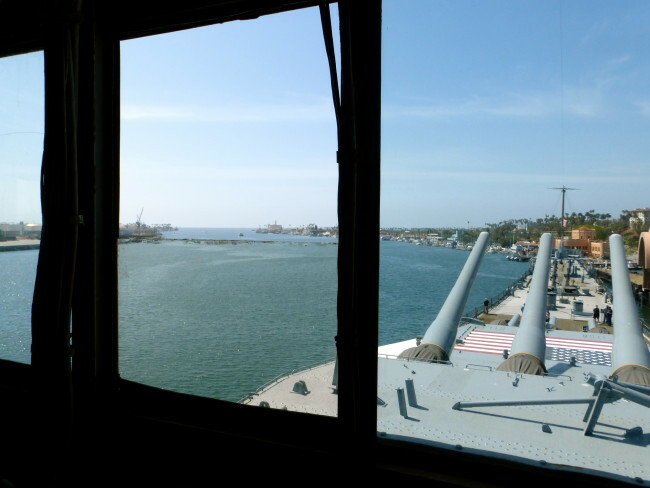 I hoped they would not fire on the dock workers unloading cargo. 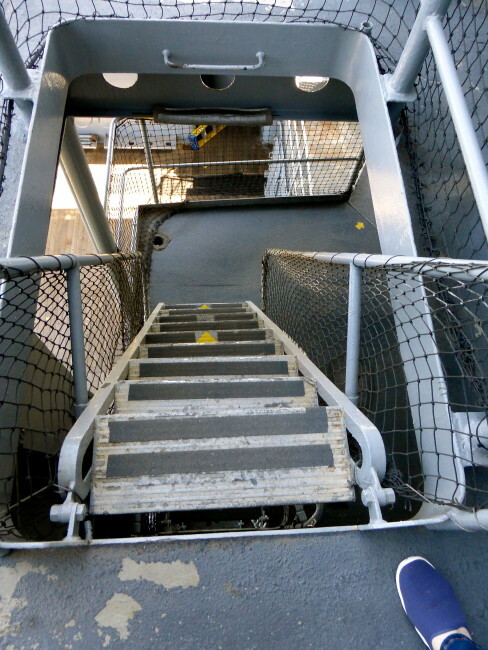 Up the stairs to the next level we climbed, even more carefully. I quickly realized this ship was a danger if you’re on blood thinners like me. 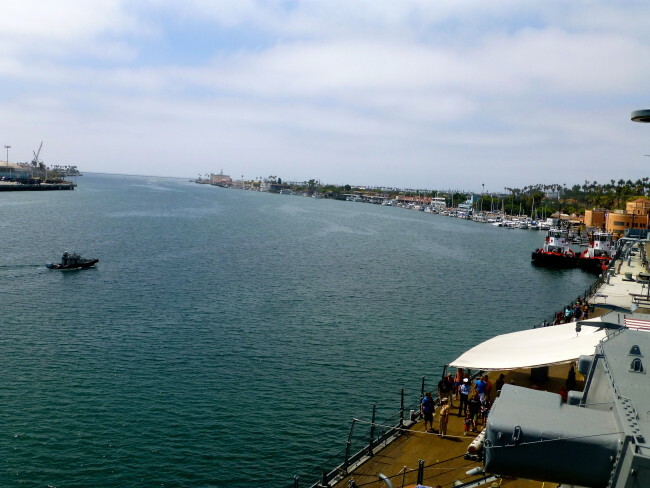 Both days we visited, the weather was perfect. 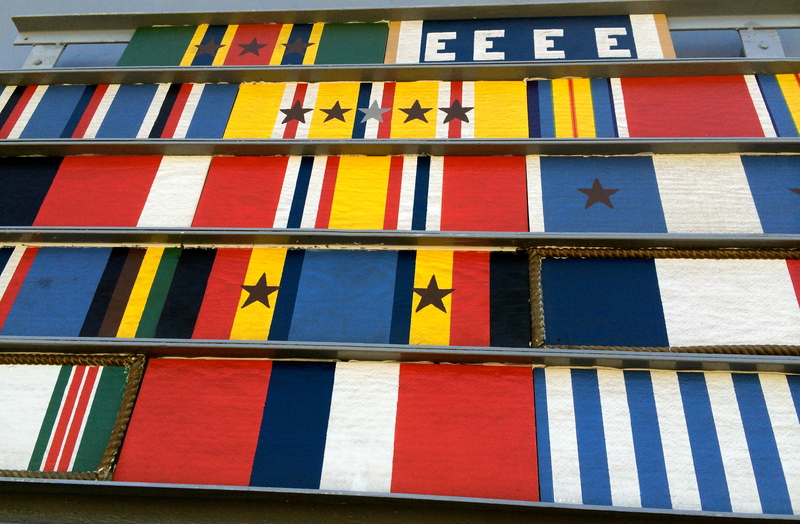 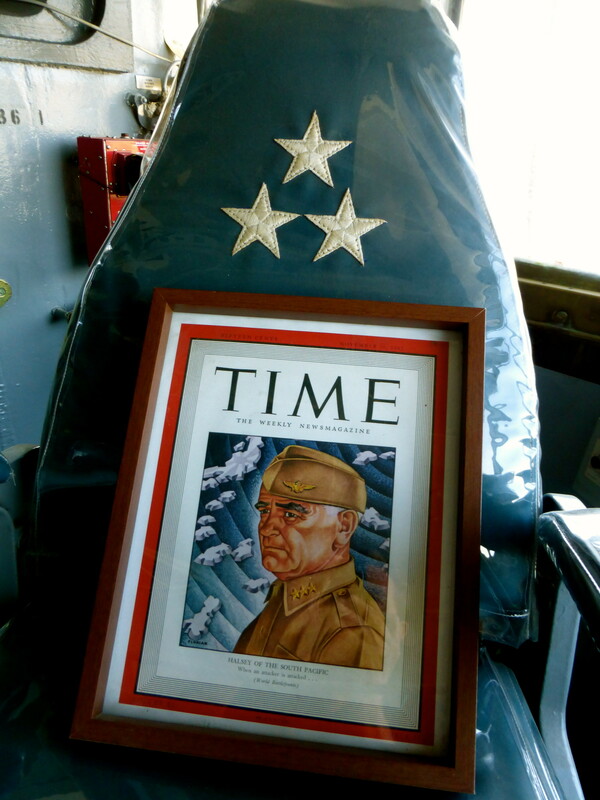 …while I stood by to see a Time Magazine cover of Admiral “Bull” Halsey on the Level Flag Bridge. …by a door that weighed 2 tons and walls that were 17 inches thick. 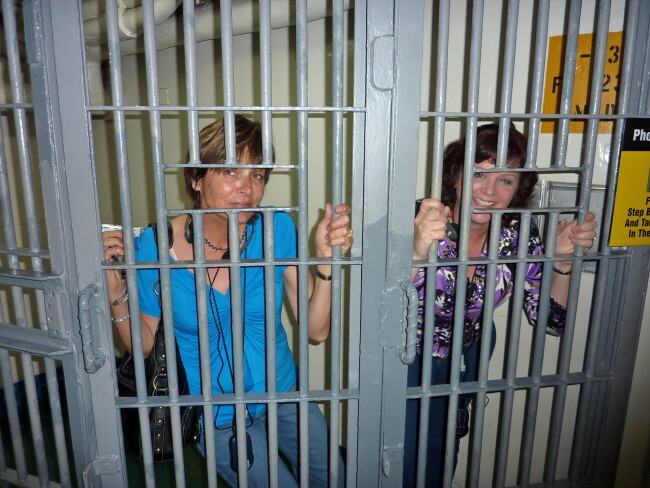 Even though we were in a tower of the same name, I don’t think he was conning us. 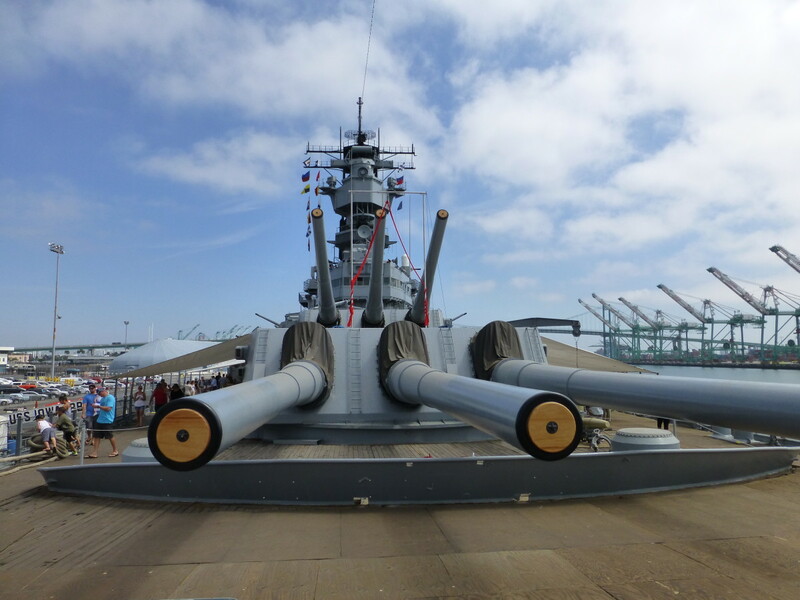 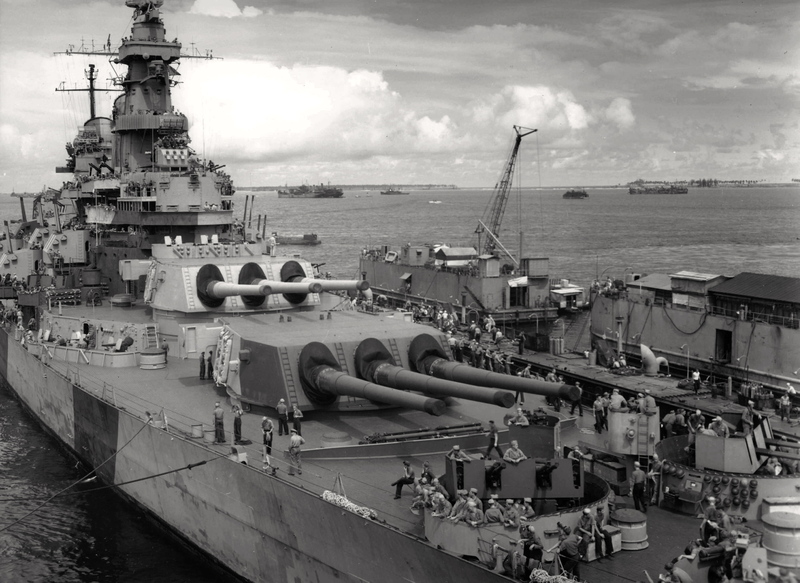 The USS IOWA (and its class of ships were mothballed after World War II but came back into action during the Korean War, The Viet Nam War and both wars in the Persian Gulf. 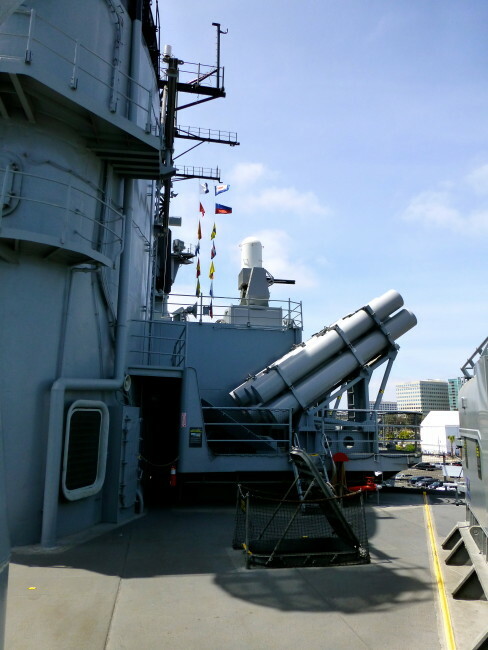 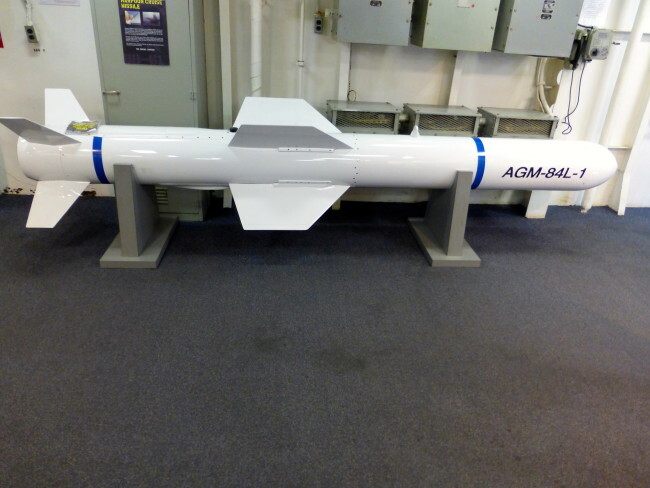 Of course, it has been equipped with new weaponry like cruise and Tomahawk missiles and updated missile defense systems for those conflicts. Hey, I told you…watch your step! 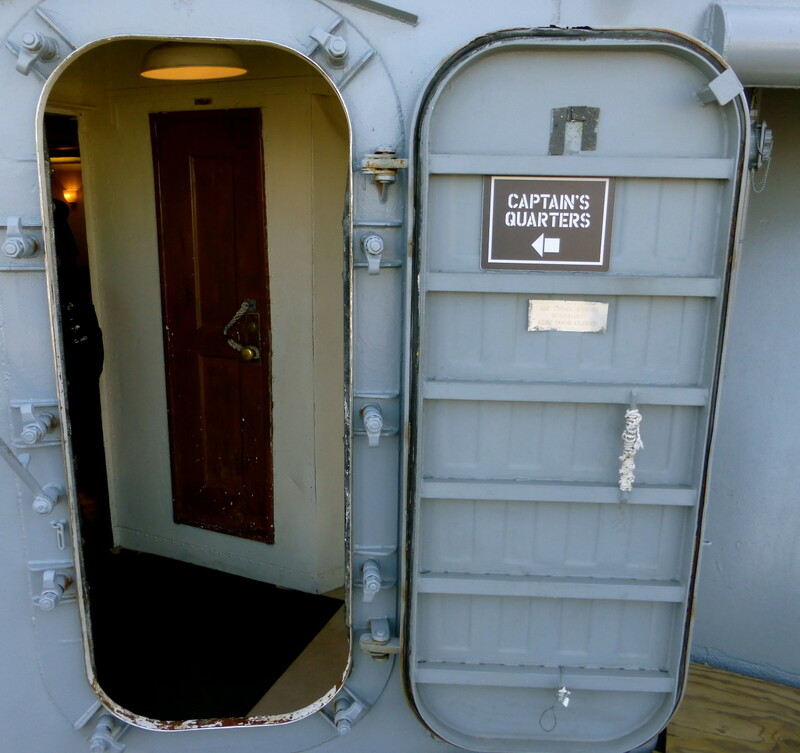 Be especially careful of the lips before the steps…that first step could be a doozy…and your last. 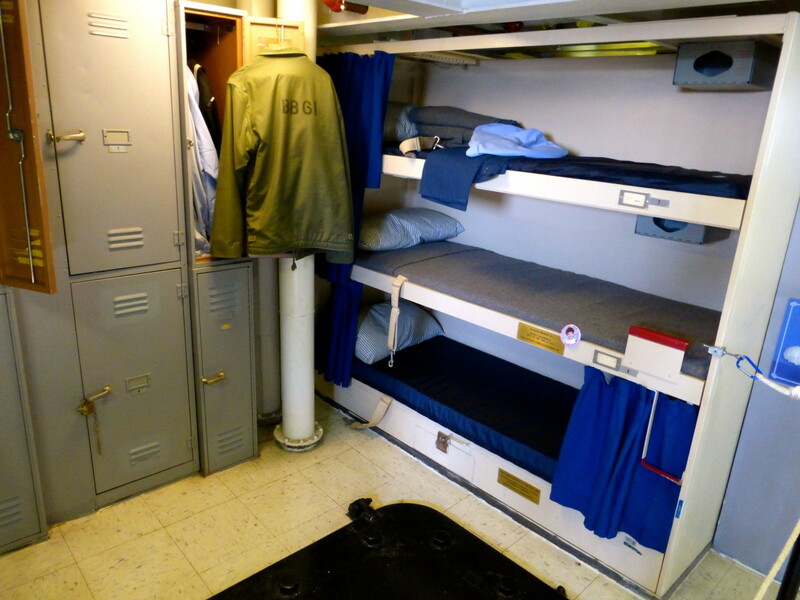 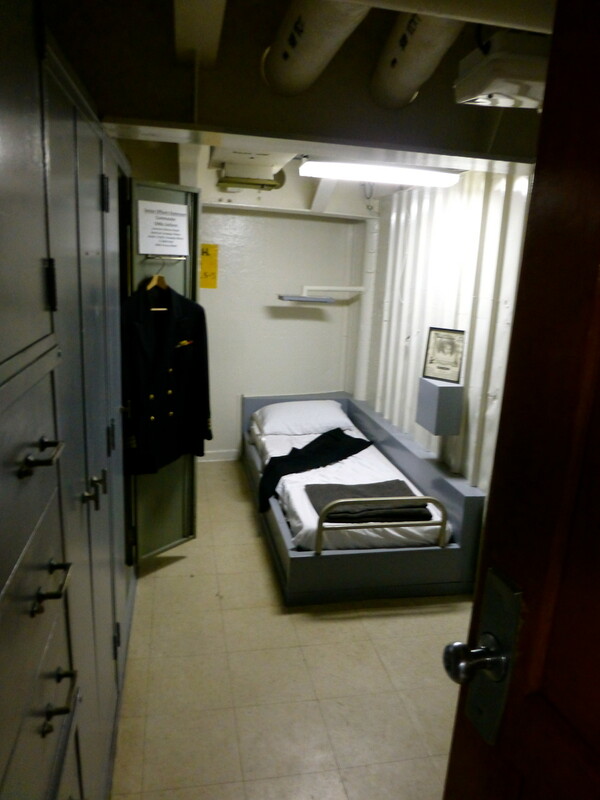 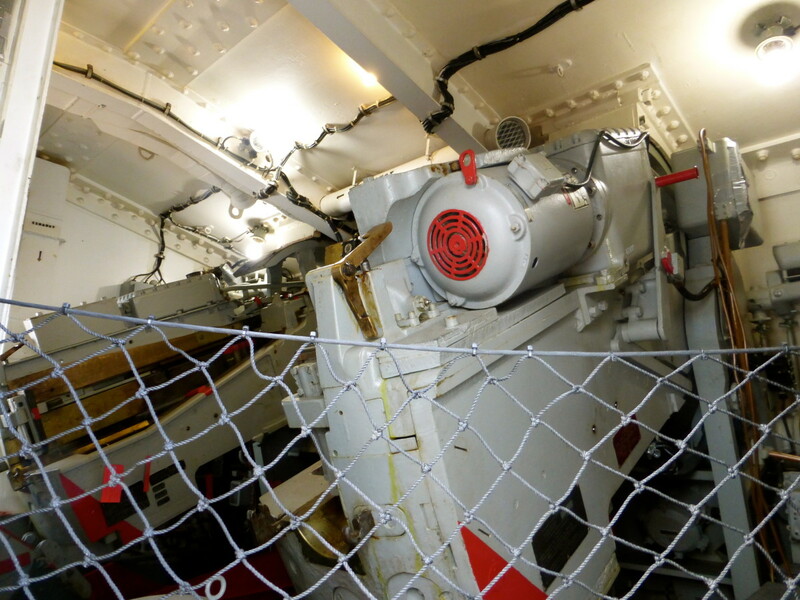 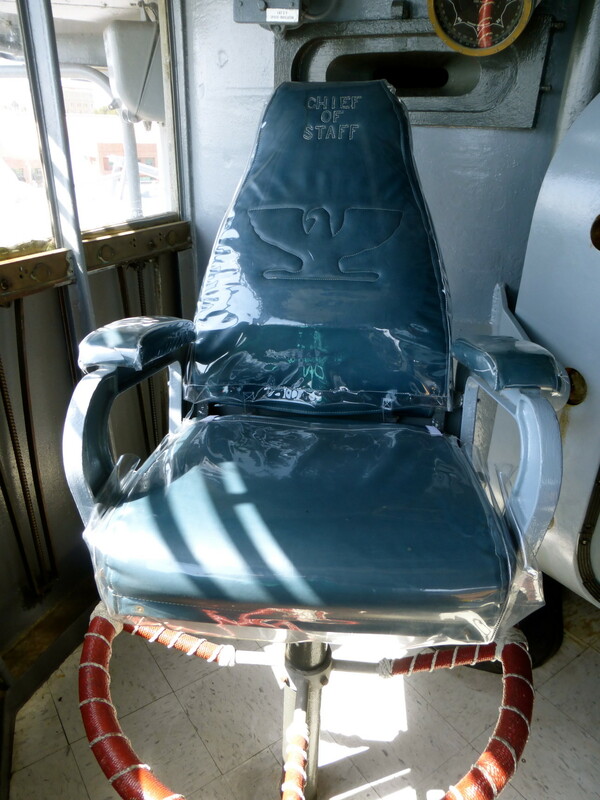 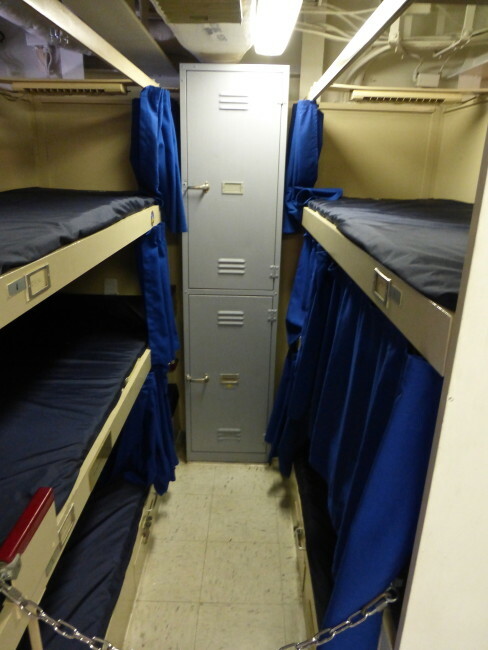 We finally saw where the crew slept…not quite as cushy as the executive officer’s quarters. 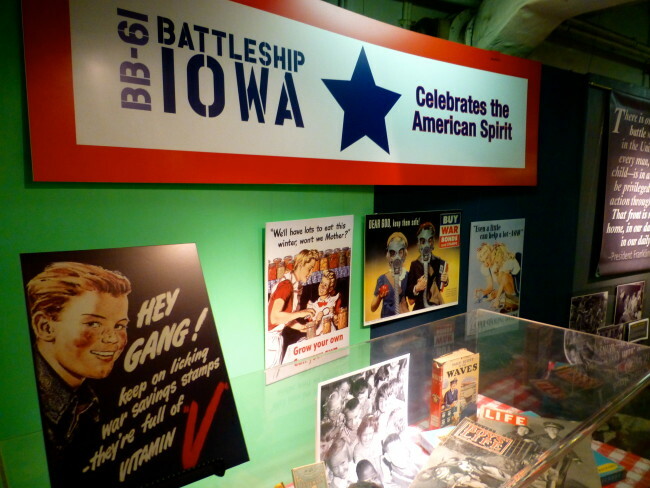 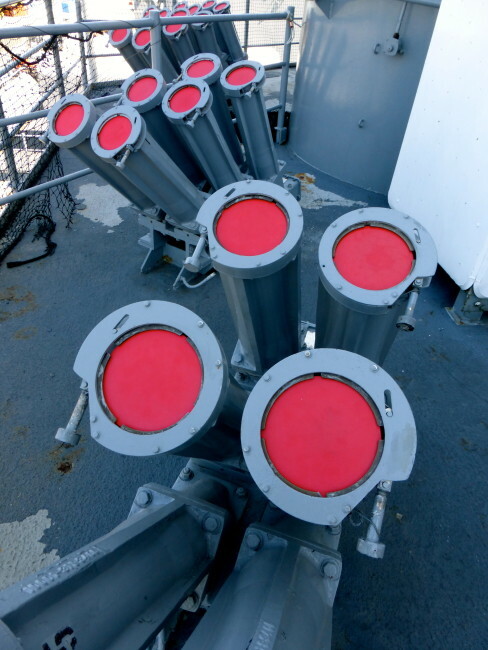 The IOWA also hosts parties, and if they get out of hand, those guns could come in handy. 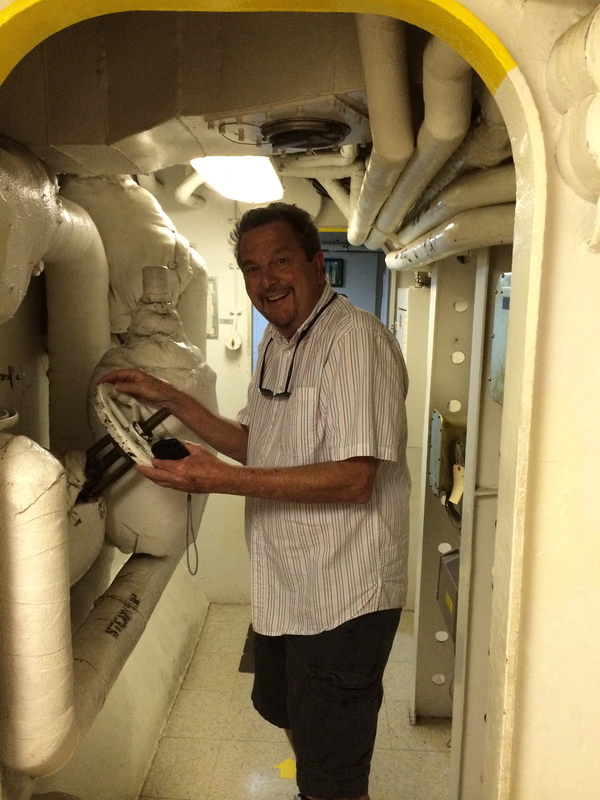 I guess being in the back of a ship can make one stern. 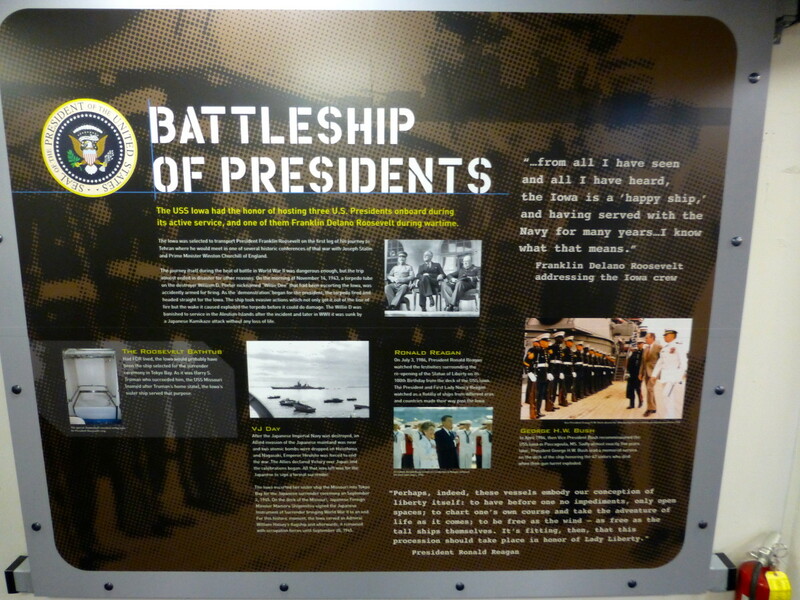 Besides Roosevelt, Ronald Reagan (who boarded for the celebration of the restoration and centenary of the Statue Of Liberty in 1986) and George H.W. 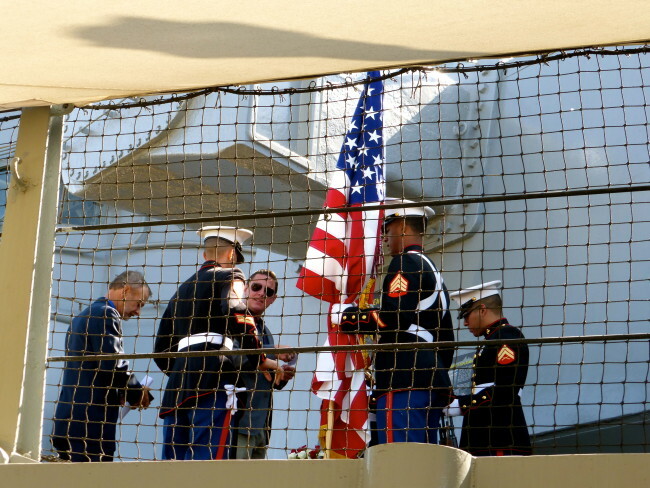 Bush (who was there for the memorial service for those killed in that freak explosion) have also been guests aboard the IOWA. 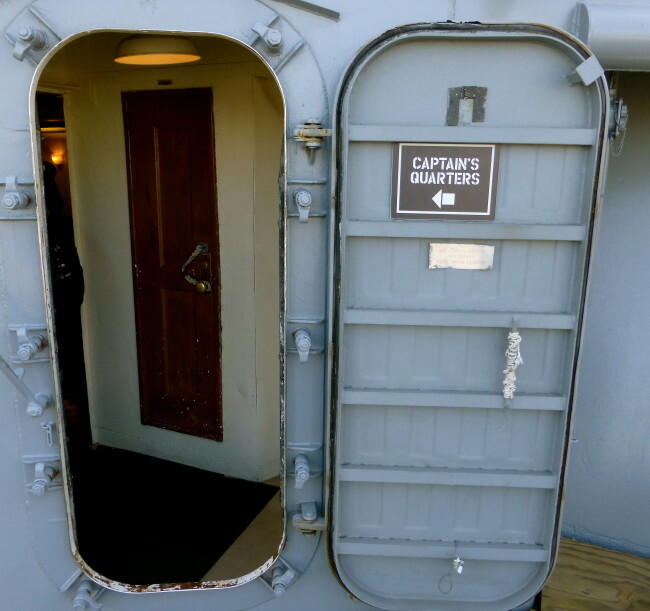 Reagan came with wife Nancy, which is why the ship has a woman’s restroom (true story). In 1923, the USS Mississippi also had a tragic accident when 48 crewmen were asphyxiated as a result of an explosion in her Number Two main battery turret (an eerily similar number of casualties as the IOWA sustained…the accident happened off the coast near San Pedro). There is also a plaque commemorating those that lost their lives on the Mississippi. While we toured, numerous veterans who came on board got their just due. They were announced over the loudspeaker, each mentioned with their time served in the military. 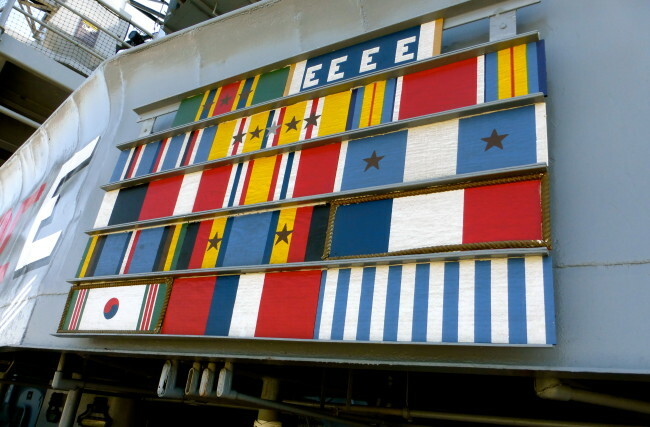 Two of them had served aboard the Iowa (one in 1956 and the other from 1988-89). 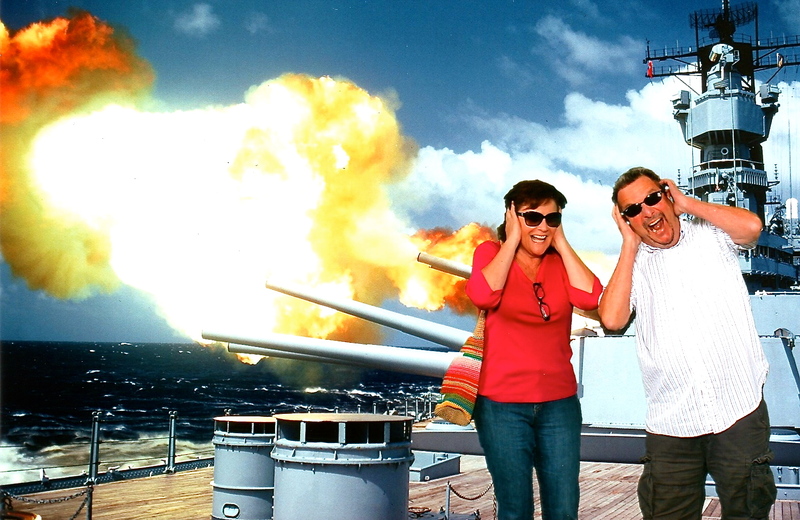 There’s also an extensive gift shop, and, yes, a place to buy those crazy pictures that they took of us before we boarded. Our self-guided tour took about 90 minutes, but you could easily spend longer if so inclined. The Battleship IOWA is the only battleship permanently moored on the West Coast. 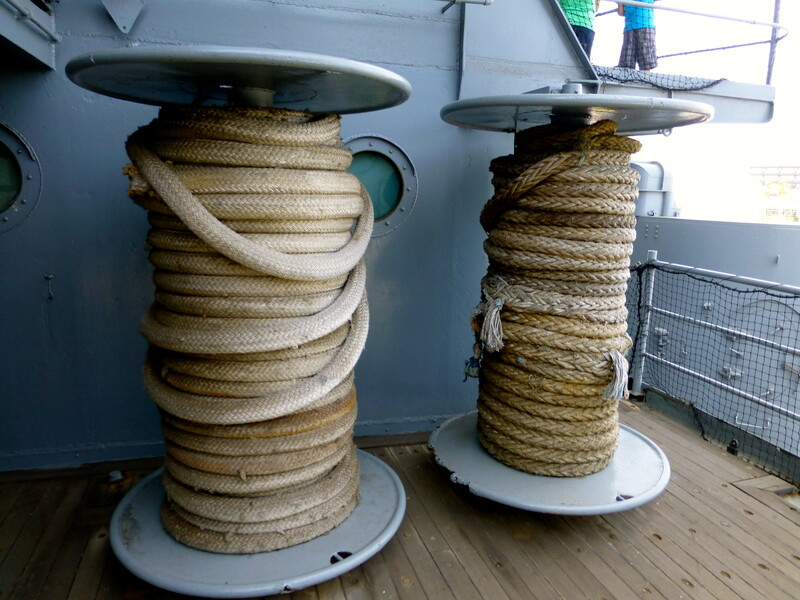 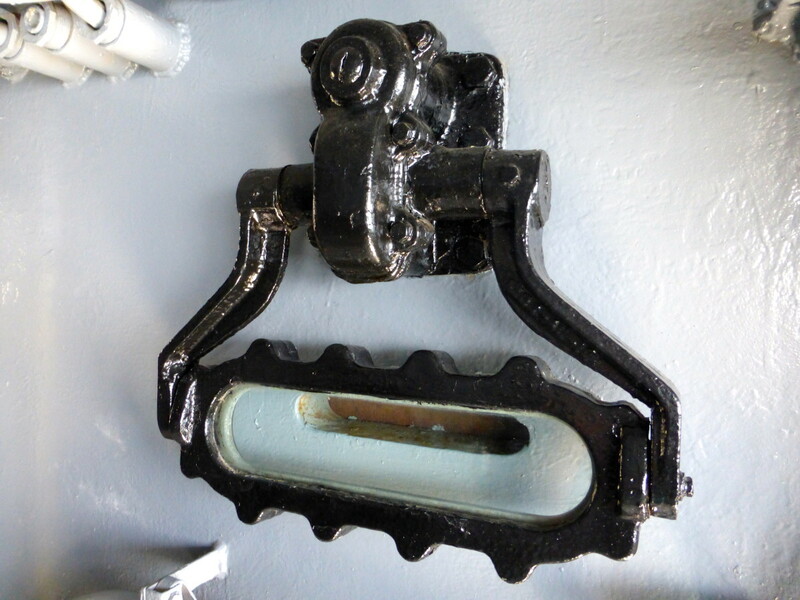 At every turn, there are interesting parts of the ships to view and interesting stories to hear. 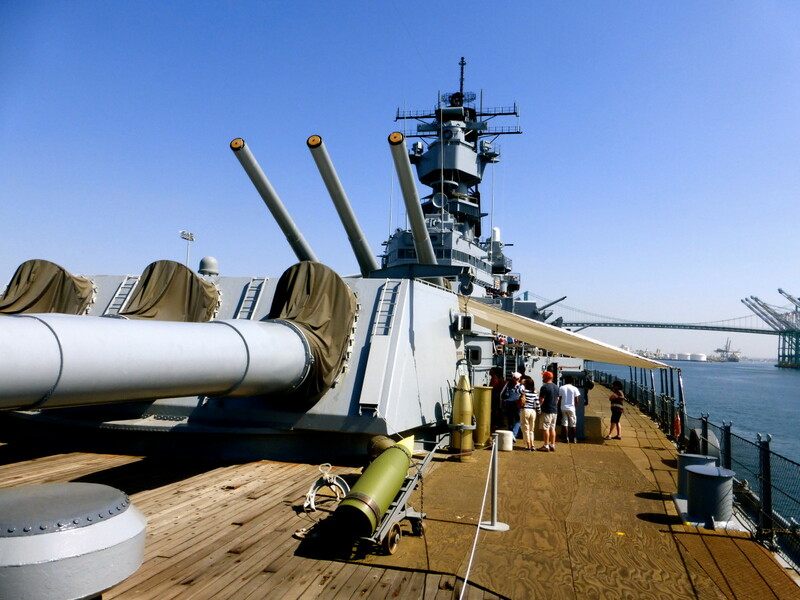 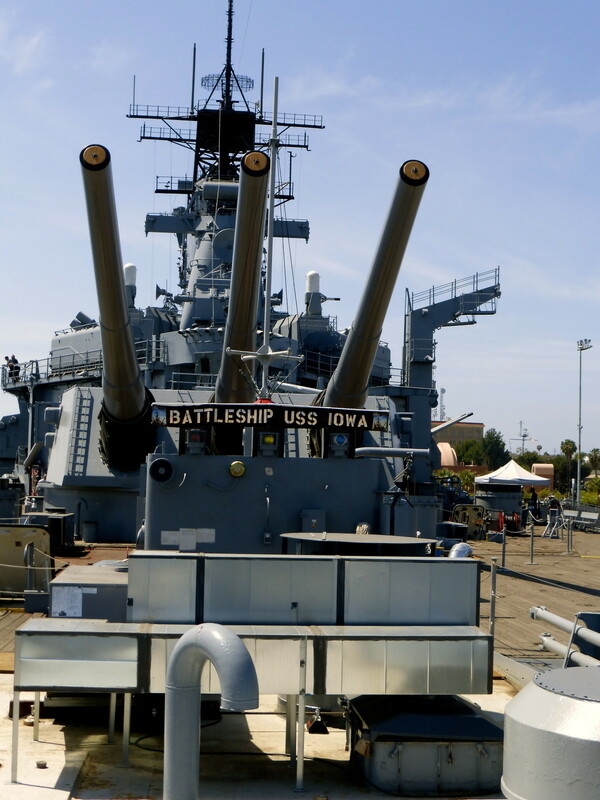 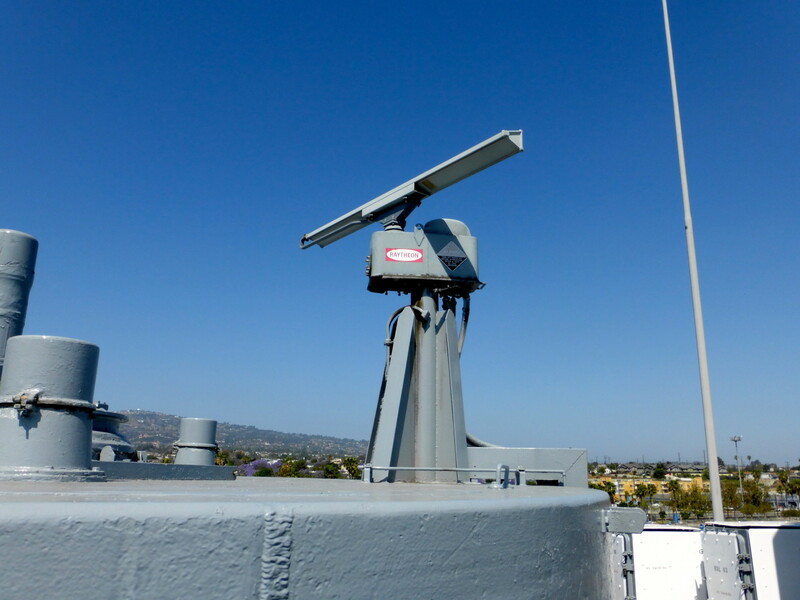 The Battleship IOWA is an integral part of U.S. naval history, and now you can be a part of it. 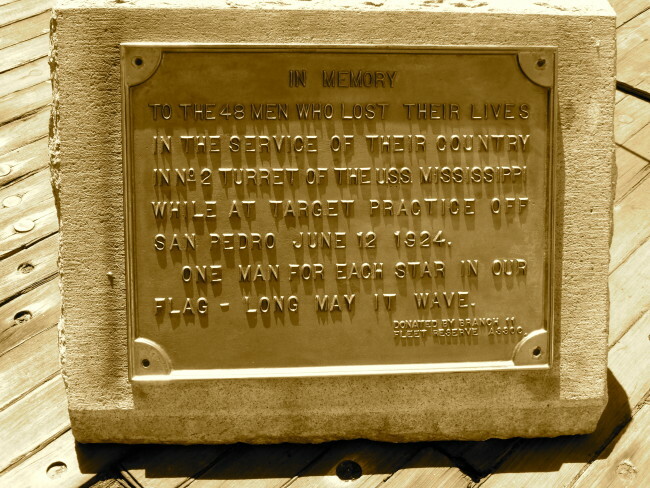 With Memorial Day coming up, I can’t think of a better place in the area to visit. 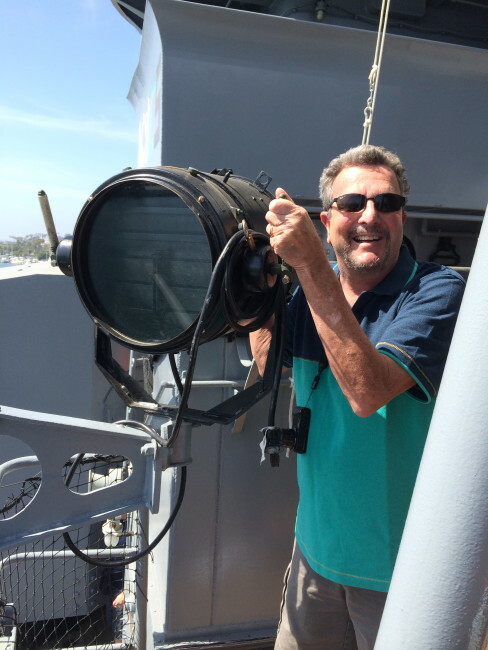 Directions From Northern (LA) – 405 south to exit 37 to merge onto I-110 South toward San Pedro. 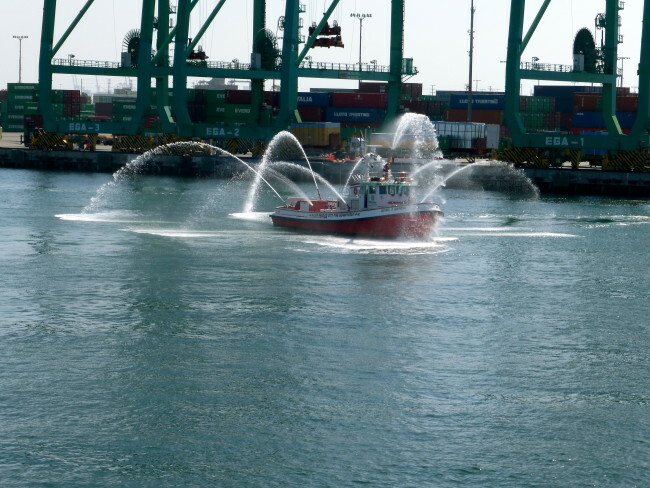 Take exit 1A to merge onto CA-47 N toward Vincent Thomas Bridge/Terminal Island/Long Beach. 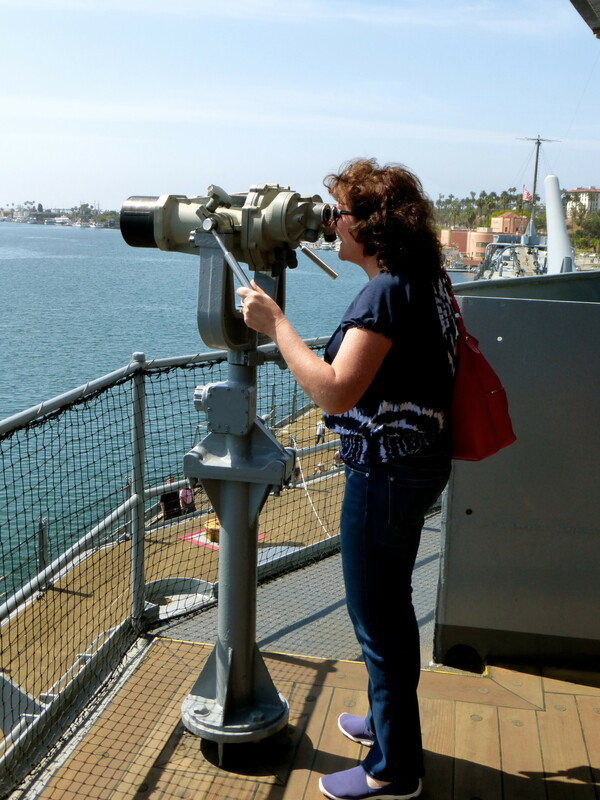 Take the South Harbor Blvd exit to continue on S. Harbor Blvd.